Purchase the Support Service that suits you best and let us take care of your store migration! Wanna move up to 1 000 entities to your new store? We will migrate products, customers and orders with all related information in no time, so you don’t have to do it on your own. The migration cost of 1 000 entities is already included in the package. You can find more detailed information on any of additional options and their functions in our article here. Feel free to contact our Support Team for any questions about choosing additional options for existing migration. Our tech engineers will help you to select proper options, accordingly to peculiarities of your unique migration. Although additional options are free, migration of reward points and 301 redirects may require installation of extra modules. Their cost is not included in Data Migration Package price. Due to differences in algorithms for encryption in shopping carts, migration of users passwords is available for limited number of platforms (unfortunately, it is impossible for hosted carts). That is why passwords migration requires additional investigations of your specific case. For more details look through our FAQ. In case you need to implement any changes for your migration we provide an opportunity to restart data transfer for 1 time. Remigration can be performed within the same Source and Target stores during 7 days after Full Migration is completed. After migration is complete, we will check your store database to ensure that all data was transferred accurately and is shown on your storefront with default template. When all is checked, you are welcome to enjoy your new store! Apart from all the features and services, you get an opportunity to request any of the available additional options free of charge, as a bonus to the Basic Data Migration Service Package you've ordered. We will complete Demo Migration in 5 and Full Migration in 10 business days after verifying access details. If it isn’t possible to access your shop due to wrong store info or provided information isn’t enough to complete the order, our Support Team will contact you. Please note, in this case order fulfilment date will be postponed. If you don't request any modifications for 2 months after our tech engineers validate the result of migration, the Package is considered to be successfully performed. After 60 days time is up, all customizations will be done for additional cost. You can find more information about Basic Data Migration Service here. If the quantity of items you migrate exceeds the limits of Basic Data Migration Service, the payment for the rest will be charged additionally. Can’t decide which Data Migration Service package to choose? 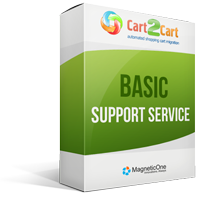 Contact Cart2Cart Support Team and we will help you to pick the most suitable package. Is Basic Data Migration Service not enough for you?